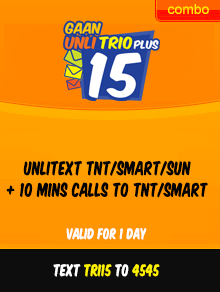 Talk N Text has released a new promo, the Gaan Unli Trio Plus or TRINET, which means the 3 networks run by SMART Communications which is SMART, Talk N Text, and SUN Cellular. By registering to TRI15 you'll get unlimited text to TNT/SMART/SUN networks. And it doesn't only come with the 15 pesos bundle, but also with 20 pesos subscription. Enjoy unli text to SMART/TNT/SUN with free 10 minutes of call to TNT/SMART only. How to call: Dial *4545 + 11 digit of preferred subscriber. Unlimited text to SMART/Talk N Text/SUN with free 20 minutes of call. To call: Dial *4545 + 11 numbers of TNT or SMART subscriber only. I am planning to buy sun load, can you give me promo codes?